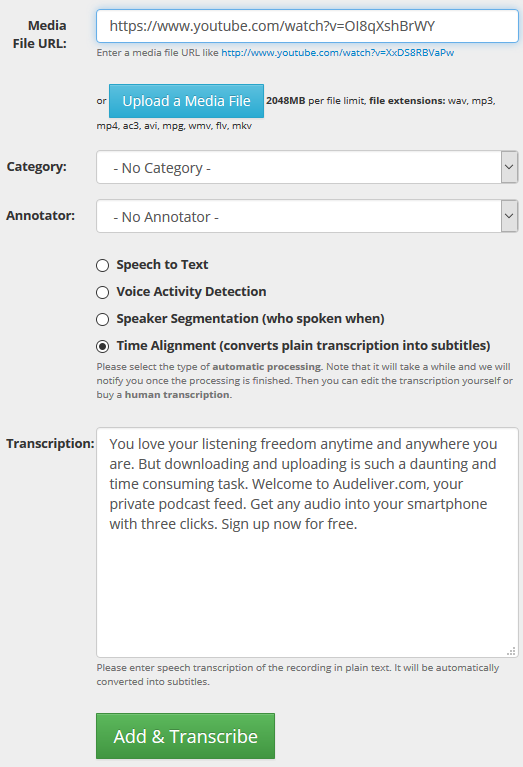 SpokenData transcription editor has several new features that should come in handy. We have added info on elapsed time since the last save, slightly modified the graphics and changed the video player. We switched from JW player to MediaElement.js which gives us more customization control. When playing the video there is now more precise synchronization between the video player and the waveform component. So give a try to our updated editor. The editing experience should be smoother than before. We have implemented automatic and language independent text to audio alignment. What is it all about? 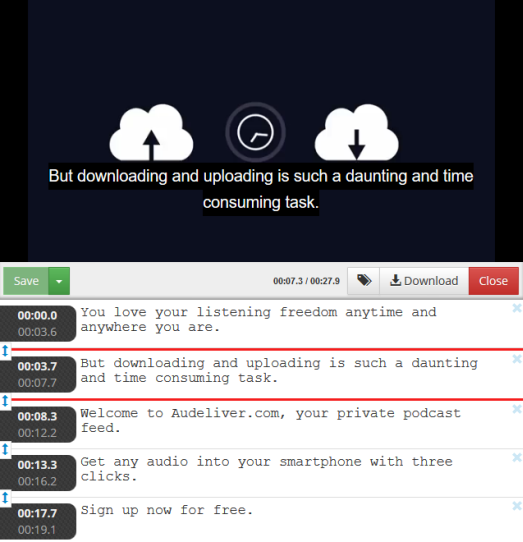 In short, you upload your audio and text and you get the subtitles. See the pictures below. What is the time alignment? The alignment is a process attaching time stamps to a transcript or text according to the audio. Usually the text is without timing. A sentence, a paragraph, a page of text does not have any timing information. But when you have an audio attached to this text -- means the audio contains a speech -- you may want to add the timing information to the text. To know when a particular word was spoken in the audio. You can imagine the process as making subtitles (time aligned sentences) from your text and audio. The good news is that alignment can be done automatically and in our case even language independently. You wrote a script for a lecture, talk, pitch, or news. You "read" the text and got a recording. Now you want to make subtitles. It is waste of time and money to transcribe your speech again. Use the aligner. You asked someone to have transcribed your audio and then you got only plain text. But you found subtitles useful later. Just align the previous transcript to your audio using our aligner. Can also be useful for e-book to audio-book alignment. 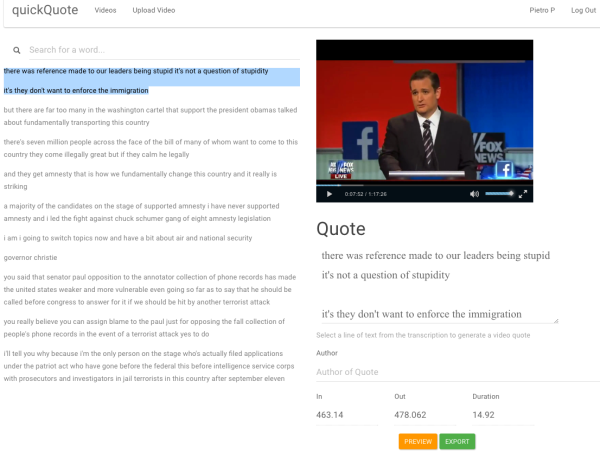 Here you just need to put your audio and text into SpokenData.com and you will get aligned text (like subtitles). Plus you can use our editor to edit the text, timings, etc. You can use our API. The largest advantage of our approach is in its independence from the language. It should work reasonably well for any language. This technology has also some caveats. It expects that the speech in the audio and the text fully matches. Assuming that you have part of your speech untranscribed or some notes in the text not spoken in the audio, the technology does its best to align it. So in such cases there can appear time shifts near these regions. Since last week, the entire SpokenData website has been using HTTPS, so not just only for authentication and payments as previously. All HTTP requests are automatically redirected to HTTPS ones. We try to keep security pretty tight. QuickQuote is a web application helping users to select video quotes from a video and embed them in an article. 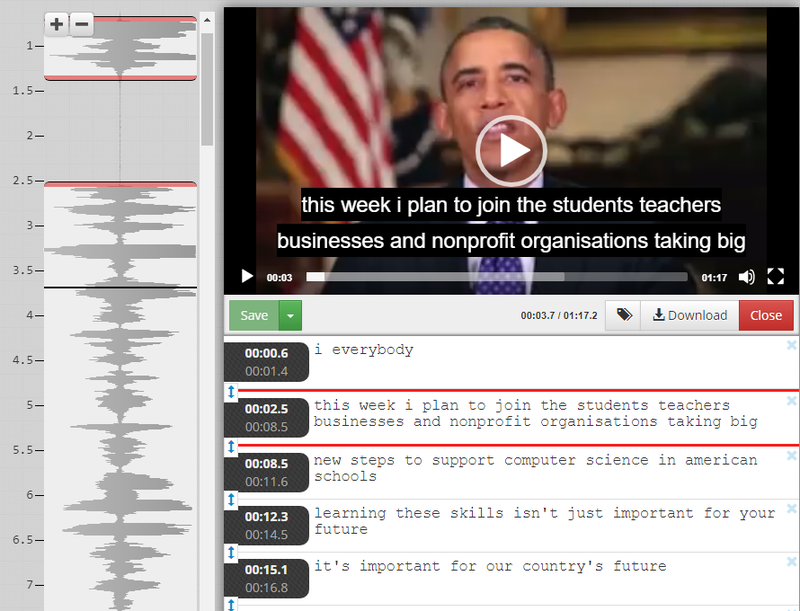 SpokenData API is used to generate video transcription. This project is maintained by Times Digital and Pietro Passarelli. You can also get to know more about the tool at http://www.niemanlab.org/2015/09/a-new-tool-from-the-times-of-london-lets-you-easily-detect-and-capture-quotes-from-a-video/. 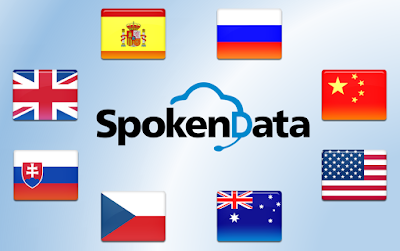 SpokenData automatically transcribes recordings in quite a number of language and more are about to come. 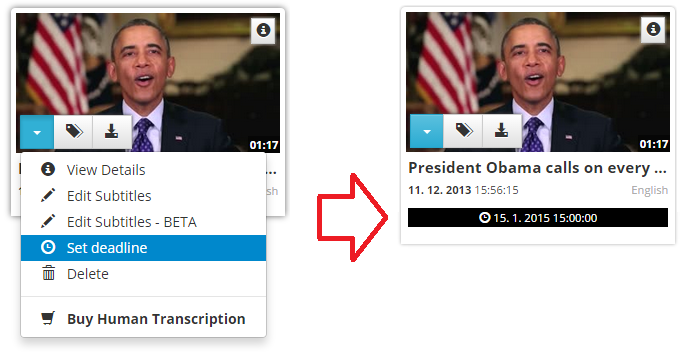 Just upload your recordings and select the language. Dou you have some specific domain of audio such as TV news, lectures and so forth? Then you can also select from specifically trained recognizers that should generate better transcription. If you have lots of data to transcribe, contact us and we will train a recognizer to get the best transcription of your data. Онлайн перевод устной речи в текст - теперь с поддержкой русского языка! Мы добавили на наш сайт поддержку русского языка, и теперь Вы можете расшифровывать записи с речью на русском! Просто залогиньтесь на SpokenData, загрузите свою запись и получите автоматическую письменную расшифровку текста на записи совершенно бесплатно! Вы также можете указать путь к вашей записи с помощью ссылки на YouTube, Vimeo или любой другой онлайн хостинг. Наша программа скачивает данные и конвертирует аудио в текст за считанные минуты. Когда расшифровка закончена, Вы получите оповещение по электронной почте. После этого Вы можете вностить изменения в текст с помощью нашего онлайн-редактора. Для разработчиков программного обеспечения мы предоставляем простой в употреблении API. Вы все еще не зарегистрированы на SpokenData.com? Пройдите быструю регистрацию здесь и откройте для себя возможности расшифровки Ваших аудио меньше, чем за минуту! Russian voice to text online service. We added support of a new language - Russian. So, you can process any of your recordings in Russian now. Just log on SpokenData, submit your data and get automatic text transcript for free in few minutes. Another option is to provide us with URL of YouTube, Vimeo or other on-line services where your data is. We download the data and convert them into text quickly. 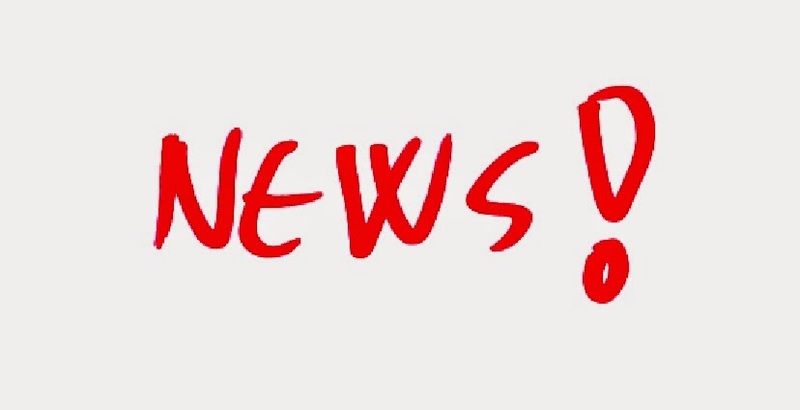 You are notified by email when the conversion of audio into text is done. 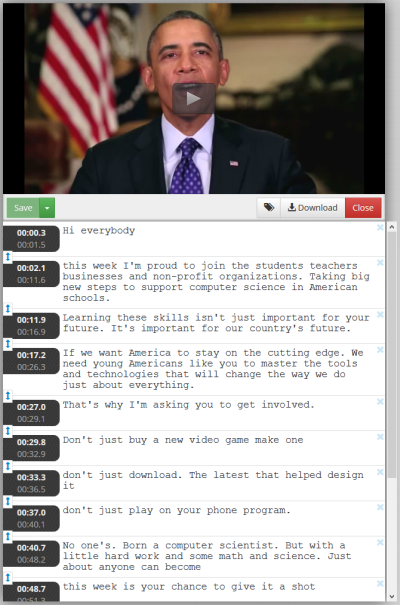 You can also edit the transcript yourself in our web editor later. If you are a developer, feel free to integrate our API. It's easy.